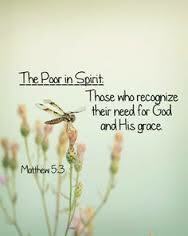 When I read The Beatitudes in Matthew 5 again, the questions I’ve had about “poor in spirit” came to the forefront. Perhaps you’ve harbored the same questions. How can I be “poor” when I have access to all the glorious riches in heaven? How can I be “poor in spirit” when I have the Holy Spirit living in me? And how can I possibly be blessed if I’m poor in spirit? Much studying required. Since this first beatitude is the bedrock of all others, we need to understand it. Jesus’ disciples did too. So as crowds gathered, Jesus took them aside to give them an outline of what being His disciples would look like; but first, He had to revolutionize their thinking because their message would change the world. Over the years the Jews had showcased their status as God’s chosen people. They stuck to the Law–even added a few of their own–and paraded their prophets with puffed up pride, but in the process they became legalistic and withdrawn trying to save their faith for themselves. But that’s not what God intended. To be “poor in spirit” means we recognize that without God we are lost, hopeless, and destitute: sinners saved by grace alone. It means that we are to live our lives as He lived His–in the world but not part of it. But as we fight our earthly battles, we often fall under the influence of the prince of the air, while Jesus lived above the fray. He followed a different plan. Even though Jesus was a human being filled with the same Holy Spirit who indwells us, He said only what His Father told Him to say and did only what His Father told Him to do. When we compare our indwelt lives with His, along with all the I-me-my words we speak and all the things we do for ourselves instead of others, we discover that we are indeed “poor in spirit.” Spiritually in poverty. Can we be blessed knowing that we’ve failed miserably as His disciples? Yes. Blessed goes beyond happy. It means having an inner joy–the unexplainable peace that resides within that sometimes bubbles over and splatters on others. It’s the “I’m lapping from the saucer ‘cause my cup is running over” kind of joy that draws others to Him. We have that joy because we know that Jesus loves us in spite of ourselves. Jesus knows that you and I will always fall short of His glory while we are here in this fallen world. We’ll never measure up to His standard on this side of eternity. That’s why He said we are “poor” in spirit. But at least we are His, created in His image to walk in His Spirit and do good works for Him. As we recognize our need for God and look to Him–instead of others–as our standard for how we measure up, we understand that we are indeed blessed to be poor in spirit; and we look forward to the kingdom of heaven. Linda. I always get a blessing from your blogs.